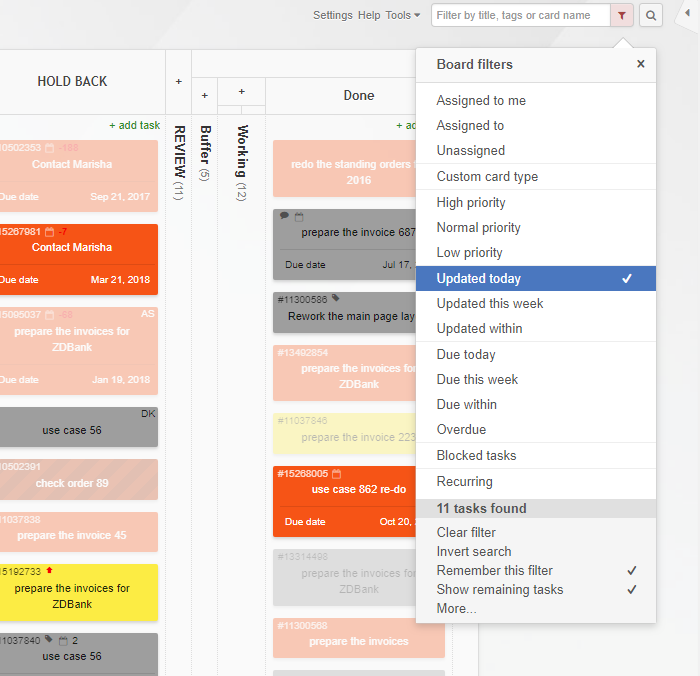 Take advantage of Kanban Tool's great features. 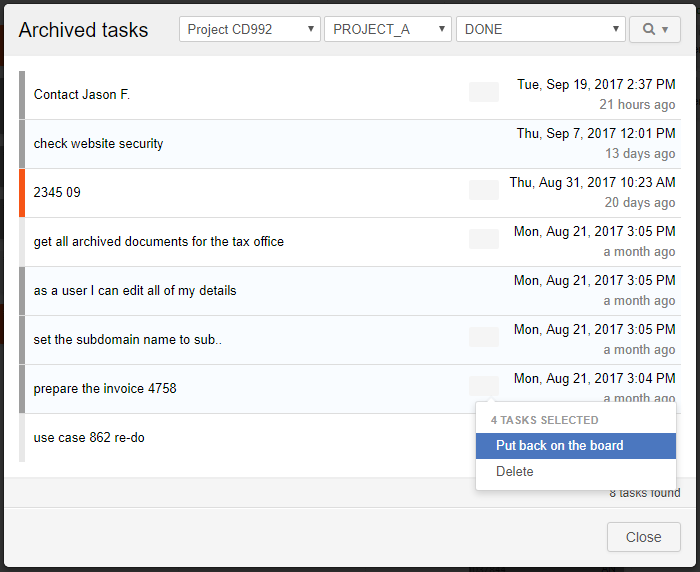 Find out how to send tasks to Archive, add information by external files, use email notifications, RSS feeds and how to filter your board and manage attachments. Together with tips on understanding the analytics. 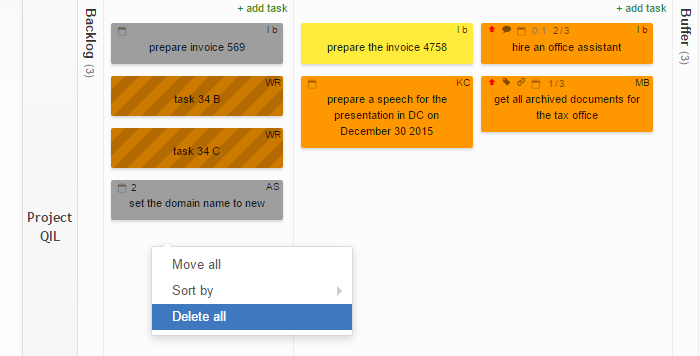 How to archive tasks on a Kanban board? 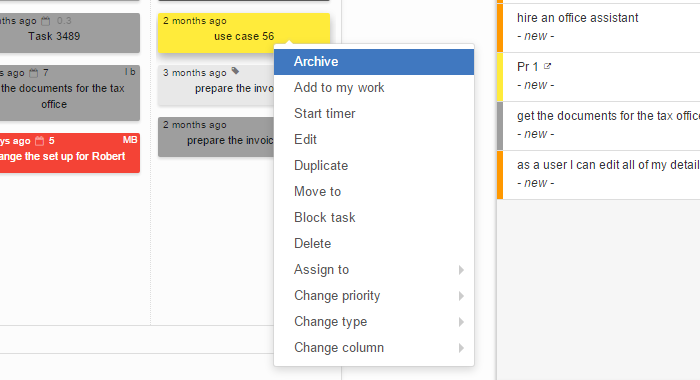 To archive a task, please right-click on the Kanban card and use the dropdown menu to find the "Archive" option at the very top. By default, this option is only available in the last column of your Kanban board. But should you wish to enable archives in any other column as well, please go to "Settings" - "Board Editor" and use the pencil icon under a chosen column's name, to set its properties in a way, that will allow for tasks to be archived there (the option is at the bottom of the column edition window). To archive all tasks in a column, either right-click on the header of that column, or click on any empty space in that column, and select the "Archive all" option. Using the archive is easy - to enter, use the "+ # archived tasks" link at the top of your last column: A list of all archived tasks for this particular column will be presented. But note, that once you're in this view, you can search through tasks archived on specific boards, swimlanes and columns. Also - you're welcome to search the archive with the magnifier icon - it supports the same set of search queries, that Global Search of the boards does - learn more here. Want your tasks to get archived automatically? Please view this page. How can I put a task from the archive back on the board? You can access all archived tasks from the "+ x archived tasks" link, found next to the "+ add task link" in all columns, that have any tasks archived. 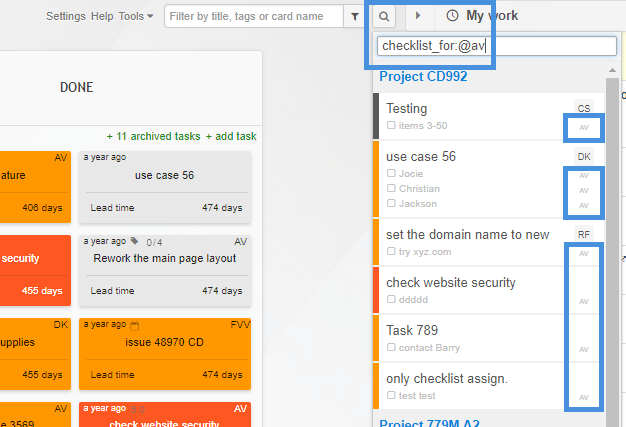 Once in the Archive, simply right-click on the card that you want to place back on the Kanban board. An option to Put back on the board will become available. You can also select multiple cards within the archive by clicking them with the CTRL key pressed, and un-archive a number of tasks in one go. What can we use to input data into new jobs? 3. Using the Chrome Add Task Button extension. 4. Creating tasks directly from an Excel spreadsheet, using an advanced macro. When do I get email notifications about task or project status change? 3. When someone adds a comment to a task and selects a person who should be notified about it. 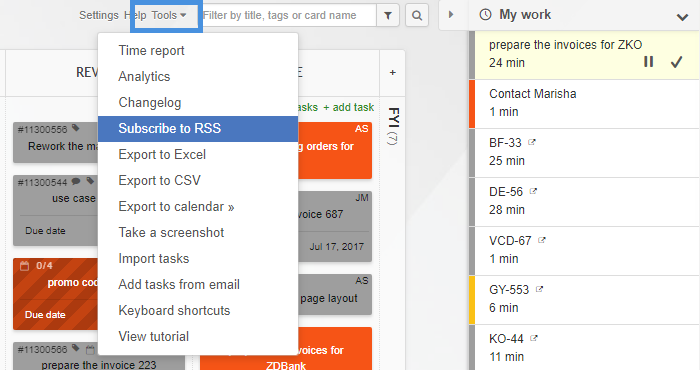 If you want to be informed about the status changes of all tasks on a board, you need to subscribe to RSS. You can choose not to be notified about task assignments, if you want to. To do this, please go to "My Profile" - "Edit my details" and un-check the space next to the "Notify me by email when tasks are assigned to me". The "My profile" section is available under your name in the Dashboard view. 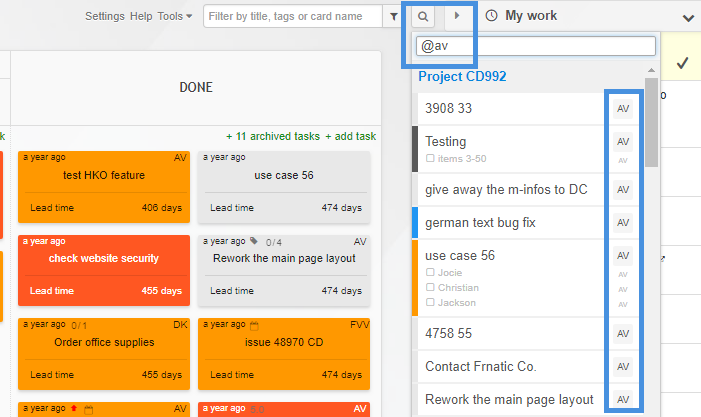 Kanban Tool also offers a Work Summary email - sent to you at the end of each day. Find our how to set the time of arrival or disable it here. You may also benefit from getting our Due Date Reminder email - sent either in the morning of the due dates, or at the end of the day, giving you a glimpse of work due tomorrow. Please see more details here. Finally, it is also possible to set custom email notifications - where you decide what their content is about. Please see how to do this via Process Automation. How to enable email notifications? To enable email notifications (of task assignment and a new comment) in Kanban Tool please go to "My profile" - "Edit my details" and tick "Notify me by email when tasks are assigned to me". What are the reporting capabilities of Kanban Tool? (to do - doing - done). You get to see in an instant how the team is performing. If things run smoothly, the horizontal bands (each color representing a different stage of the process) are staying regular (no sudden jumps or falls) - with only the "Tasks Done" stripe growing. The moment you notice a rise in the height of the "In progress" band - this alarms of an issue (too many tasks, too difficult for particular team members, team needs more time, more manpower or more information). It's the most insightful metric of all - the situation is clear without you even entering the office. This is the metric to go for seeing the average time it takes for a task to get from the point of being placed on the board to getting completed, with comparison to the time the task was actually being worked on - hence Lead vs Cycle time. So what you gain is an information about the actual process throughput. For most businesses it's a matter of great importance to keep the Lead Time is as short as possible, as this means the speed of the response to a customer's need is good. These simple pie charts offer information on the shares different values - conditions take within the process at a given moment. This analysis can be done for a whole board or for specific lanes or columns separately. The Time Report gives insight into the time usage of each team member or of an entire team. It informs on how much time the team had spent on each task. This Report can be generated for all of your Kanban boards together. There is a summary view and a detailed one. Note: the Time Report is only available on the Enterprise service plan. Furthermore, with Process Automation you can also generate own, custom email reports. - when there are due dates approaching for specific task types, and many more. To learn more about Process Automation, please visit this page. Yes, you can easily generate a link to RSS. While on a Kanban board, please go to the "tools" menu, then select "subscribe to RSS". The correct URL for RSS feeds is generated for each user individually, for security reasons - to protect access to your cards, boards and projects via RSS. Your URL should include "surl= + a number". When I duplicate a task or a board, my comments do not carry over. Why? The comment section will not be carried over when you duplicate a board (with tasks) or even duplicate a single task. Comments are specific to original task and will not be duplicated for practical reasons. The user feedback we get suggests this is the preferred way for most users. I cannot find an option to filter tasks by user. Is it possible? You can easily filter your tasks by a specific user. One way to do it is pressing the button on the right side of the search box to see a drop-down context menu, with the available search filters. Please press the "Assigned to” filter option and choose your searched user from the list. A quicker way to do this is to type: @XY - the user initials with an @ directly into the filter box. 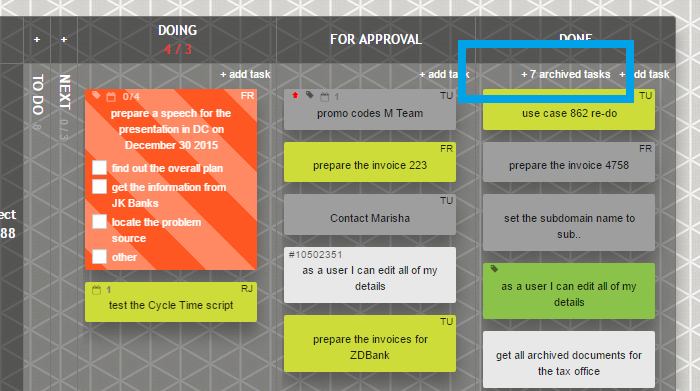 Now your board will highlight the tasks that are assigned to this filtered user. Please note that both options will have the same effect. Additionally to being able to show user assignments on one board with the filtering described above, you may also find one's assignments across all boards with the global search functionality. The difference between filtering and searching is in their range: filtering is limited to 1 board, and searching applies to all boards you have access to. You may also save the filter you've applied, so that it will check for what's assigned to you next time you log in too! Please read more about this here. Can you set email alerts for new jobs and due dates? There are no email notifications or reminders for due dates at the moment. Email notifications are sent when a task is assigned to someone and when a new comment is being added (had you selected someone to be notified; the user who created the card is notified by default). To enable or disable notifications, each user needs to go to "My profile" - "Edit my details". If you're using our Enterprise plan, you can benefit from custom notifications, set via Process Automation. With this feature, you decide what action generates an email notification. How to evaluate the Lead & Cycle Time diagram? while the horizontal axis shows the time passed regardless of any actions on the tasks - so, the Lead Time. To read the Lead Time for a particular task, please click on a blue point on your diagram. The blue line shows the board's average Cycle Time. Is it possible to delete all tasks in any active or archived column? By default it's not possible to delete all tasks from a column at once. We haven't implemented this as a standard feature, because it's quite an uncommon and potentially dangerous operation, as tasks are deleted permanently and there is no easy way to revert it if done by mistake. We highly recommend that you use the "Archive" function, rather than "Delete", as archived tasks can still be part of the Analysis of your process, whereas the deleted ones cannot. However, a "Delete all" function is available through the Developer Tools Power-Up. Can I place folders within folders? No, folders cannot be nested inside other folders. You can only use top-level folders. If folders nesting was enabled, it would create too much complexity, both technically and end-user experience-wise. Is there a way to reset analytics tracking? At the current stage it's not possible to reset analytics tracking. You can, however, select a desired segment of your analytic graph so it will show only the period of time you are looking for. Can I export all my attachements at once? You can only save each attachment separately. Kanban Tool doesn't offer export of all attachments at once. Exporting your attachments is easy. In order to download your attachment, simply open up your task and click on the attachment you are looking to export. How can I create and access online Kanban Tool notes? Then, click on "Notes" and activate them by pressing the green box "Add to your account". Now you will be able to use notes and documents for collaborative writing. 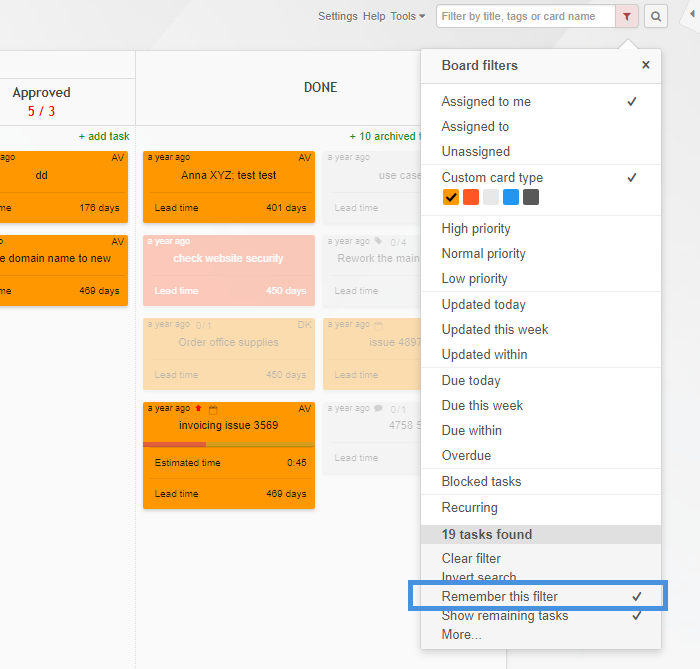 Is there a calendar view in Kanban Tool? Although there is no board template that would make your Kanban board resemble a calendar, you are welcome to build your own board with columns or swimlanes representing days, weeks or months. You may also use the optional Calendar Power-Up. To learn more about Power-Ups, please view this page. How to quickly see what my team is up to? For a constant feed of your team activity for a given board, please enable the Team Activity widget, one of the available Power-Ups. Using the filters is also a great way to narrow the board-view down to the items that were recently updated only: When looking for an overview of a whole days activity, please go to the Daily Summary emails, which will list the team's activity on all boards that you have access to. How to see most recently updated cards? The easiest way to see which cards have most recently been updated is to use the search or filter box and look for the recently updated. The search icon (magnifier) and the filter box are located in the top right corner of a board view. To learn more on how to use the search, visit this page. You may also want to utilize the Card Aging Power-Up. This will fade the least active cards out, so that getting a quick visual update of what has and hasn't been worked on is easier. Why can't I add files to my cards? File attachments are only supported in Team and Enterprise plans, not in the Free plan. You can change your account plan in Account Administration - Plan & Billing details; the difference between Team and Enterprise plans has been described here. Free plan users can still use the attachments field of their cards to attach files from Google Drive, Box, Dropbox or OneDrive. Simply activate your file hosting service integration in board Settings - Power-Ups. How to add repetitive tasks to the board? This is best done with Kanban Tool's Recurring Tasks feature. Simply enable it in board Settings - Power-Ups. For more information on this feature, view this page. How to quickly change location of a card? - Change column - this one adds an option (in a closed card right-click menu) to choose which column to move a card to. Try these out and save yourself some time. The search box can also be opened with the standard / keyboard short-cut. Note, that the type-in box, that was previously a search / filter entry box is now only used for filtering. Tasks can be searched for by their name or External ID#. Important:: searching by name requires a minimum of 3 characters. Getting the search results is quick and along with the tasks you were looking for, you will be given a hint of the values you searched by, for instance: when looking for tasks with .png files attached - names of the files will be listed below the found tasks: Please note, that a single search result is limited to 500 tasks. How to search if I only recall a task name? How to search if I only recall some task details? It's more likely that you will be looking for a comprehensive view of tasks meeting a specific set of criteria. For that purpose, a significant number of additional queries can be applied to customize the search to specific factors. The way this works is: you need to give the criteria you want to search by - in other words name the condition, such as assigned to or created by and then the value: assigned to whom, created by whom. For instance - created_by:@SD - this finds all tasks created by SD, and attachment:? - this finds all tasks with any attachments. How to search for anything that was assigned to me: tasks & checklist items? To get this information, just enter your initials with an @, like this: @XY or @xy. You will see that full task assignments are hinted for by initials in a little square, while checklist item assignments are listed as little checklist ticks. attachment:.doc - this searches for all tasks with ".doc" attachments. and the : is the operator (relates criteria to value). The accepted formatting is: @XY or @xy - "@" is always necessary. 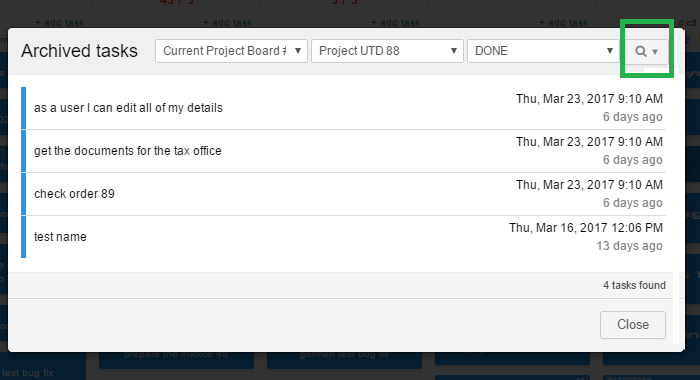 EXAMPLE board:"Project X" - this will list all tasks from board named Project X (first 500 of them). Please note, how for any criteria or value that uses more than 1 word, quotation marks or apostrophes are being used. Note, how when wanting to search through tasks assigned to specific user, their initials need to go before any other criteria and value. EXAMPLE @am priority:1 description:"do it urgently"
EXAMPLE @XY tags:urgent tags:"external work"
Note, how when looking for multiple values of the same criteria found in one task, the criteria name needs to be re-entered. EXAMPLE subtasks_completed_count=1 board:"Jameson Bard And Co."
- this search looks for cards with specified values in custom fields. Note, that for as long as you know the name that was given to a specific custom field, you can use that name instead of "custom_field_1"
block_reason - searching through the reasons why tasks are blocked, so refers to blocked tasks only. Of course, what you'd be looking for here are the blocking reasons accepted and most used by your team. time_estimate - searches by the amount of time that was set as in the Estimated Time field. Please note, that this time format is required: HH:MM and using other values may result in finding incorrect information. Please note, "timers_total" value will be 100% accurate only for tasks that are not timed at the time of making the query. As you can see - global search really does have some serious superpowers. It's been shown by what criteria you can search boards - let's sum up the values and operators (what relates criteria to values) that are supported. 2. Number of minutes, hours, days, months or years, as in: 20.minutes, 3.hours, 7.days, 2.months, 2.years. For singular numbers, you can also use minute, hour etc. As demonstrated in the above examples, any value that you are searching by (RVAL) that is made of more than 1 word, needs to be placed in quotation marks or apostrophes. In case you have any problems with using the global search functionality, feel free to contact us for help. Can I save a filtered view of my board? Yes - for keeping one set of filters always present on your board, just use the Remember this filter option from the filter menu: It will remain applied for as long as you want, regardless of reloading the board view or closing the browser window. In the latter event, when you re-open the board in a new window, you will be reminded that the filter is active with this little notice: To remove the filter, use the provided clear filter option on the notice or in the filtering menu. Is there a due date reminder functionality? 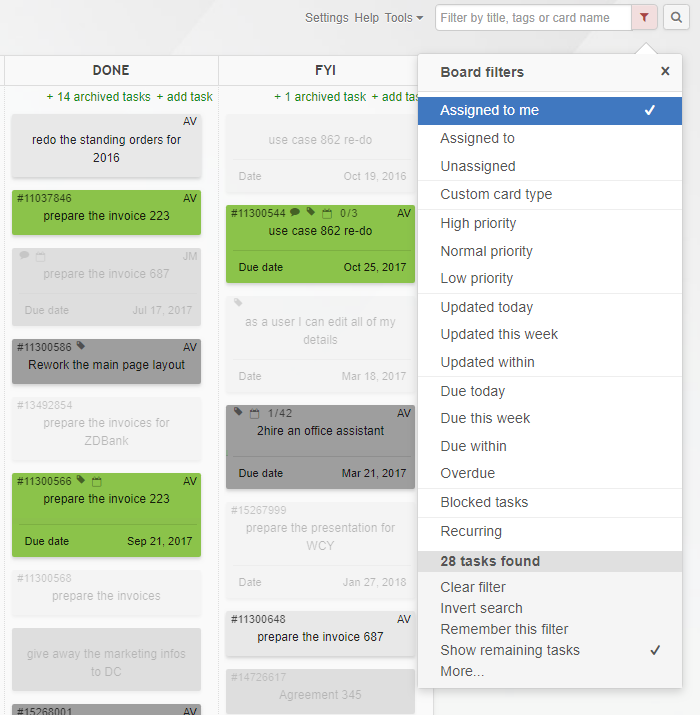 Kanban Tool's due date reminder email is a great way of staying on top of all your due tasks across multiple boards. At a time chosen by yourself, you'll get an email notification of all your tasks due today (if an AM hour is chosen) or due on the next day (if a PM hour is selected). The email will name due dates for tasks that were assigned to you or created by you and kept unassigned, so - by assumption - meant for you. To manage your reminder email preferences, please go to My Profile, available under your name displayed in the top right corner of the dashboard view (all boards names). 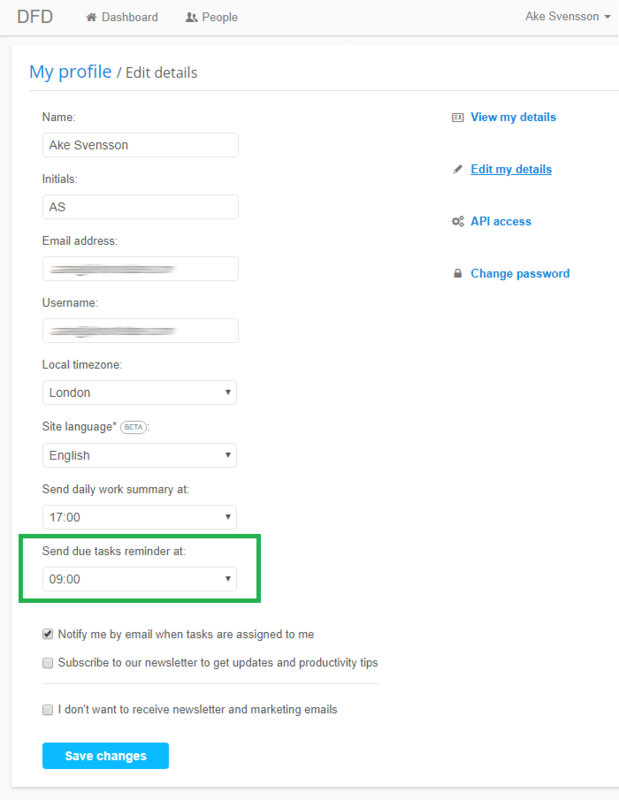 On the Edit my details page, choose the time of the email arrival and save changes. If you're not sure how to use due dates functionality with Kanban Tool, please visit this page. Note: If you don't want to receive these emails, simply select "Never" from the hour selection dropdown. 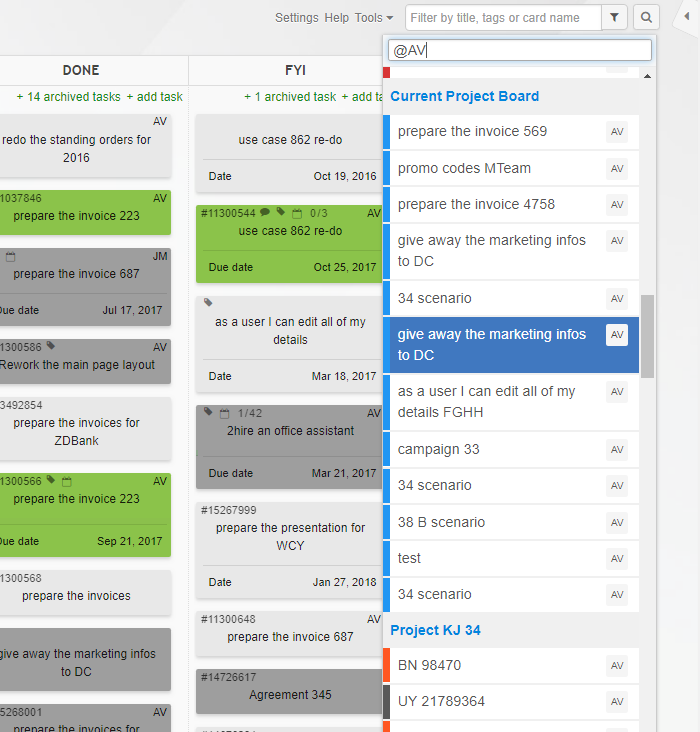 Kanban Tool Enterprise plan users can create own rules, for when due date notifications are emailed to them. To create such an automation for your board, go to board Settings - Process Automation and type in the conditions for when emails should be sent. For more examples of automation rules, please visit this page. Is it possible to mass update tasks? Yes, you can perform updates on a number of tasks at the same time. Some basic changes - such as changing priority, type or assignment - can be made after a number of tasks were highlighted at once: In order to make more advanced mass edits, please use the import functionality. For as long as you provide IDs of tasks already present on the board, the imported information will overwrite current data placed in them. It's a very good way to manage changes across a large number of tasks in one go. Process Automation is a clever way for you to determine an action on the board to be causing a reaction. 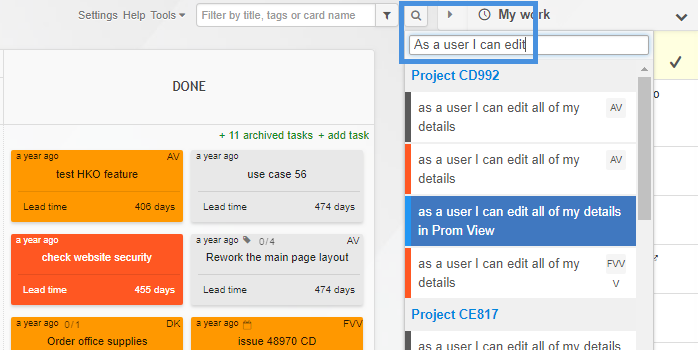 For example, you can make tasks of a certain type (color) get assigned to a relevant team member, you can change card priority basing on a set due date, or set a custom email notification for when a card meets a set of your requirements: task values, position in a given column or swimlane and many, many more. To add an Automation Rule to a board, please go to board Settings - Process Automation and use the widget provided. There are a few examples predefined for your convenience, but you are most welcome to create any rules possible on your own. It's easier than it may seem! Please note, all Process Automation rules and trigger buttons are only available to users with Project Manager, Account Administrator or Owner privileges. 4. When a task is moved to Monitoring, change the card template to financial analysis. 5. When any task on a board is updated in any way, send a notification to Jónsi. 7. Archive red tasks in the Done column, that have not been updated for 7 days. 8. Notify me of high priority tasks becoming due in 2 days. 9. Notify Daria when there are tasks that have been worked on (timed) for more than 8 hours. 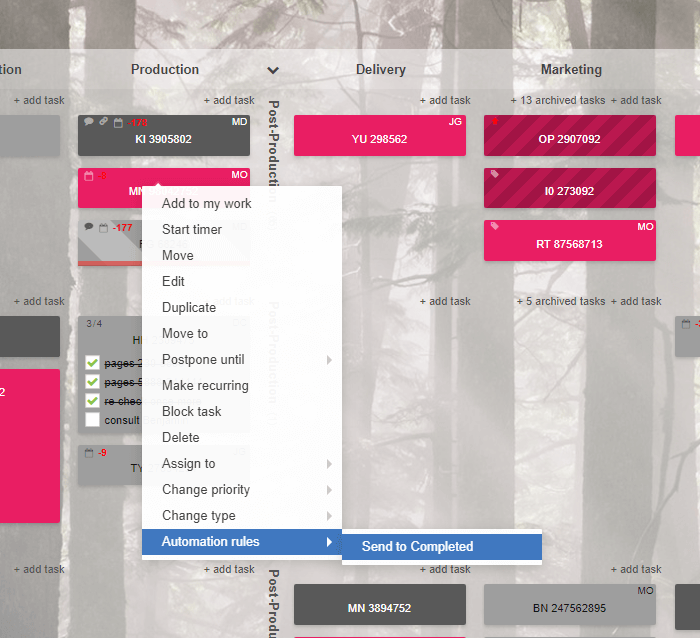 Also, it is possible to create automation rule trigger buttons, on clicking which, a specified set of changes will be applied, either to one task (when using task buttons or menu options) or to all tasks (when using board buttons). a notification about them to set users. Buttons like this are added to a board's side panel, under Process Automation. 11. Create an in-task button, clicking which will send the task to Production column, and change multiple details of the task for you - assignment, due date, type, custom field selection, in this example. 12. Add an extra task menu option, letting you move the task straight to Completed. For detailed information on the syntax needed for own automation rules creation, be sure to review this page. Should you get stuck or come across any issues, feel free to contact us for help. Please note, Process Automation is only available to the Enterprise plan subscribers. You can change your service plan any time from Account Administration - Plan & Billing details.